A relatively recent tradition is our marathon tv-radio-in-store day in New York. It's a lot of fun, if gruelling. It goes sometehing like this. Assembly in the hotel lobby at 5.30am. 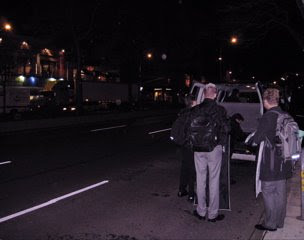 Pre-dawn departure from our West Side hotel in vans sent by the Today show. 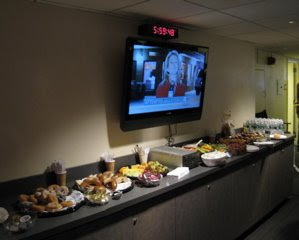 Arrival at the Today Show green room where breakfast awaits. 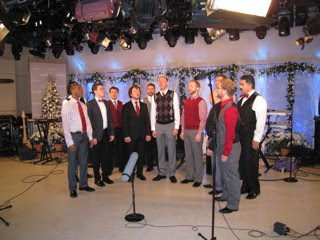 We love and appreciate and wouldn't trade our Today Show appearances ( now a tradition for them too, we hope), but for our six or so minutes of air time, we spend more time at NBC than we do at the Met for a double concert! There were many and varied guests on Today today. 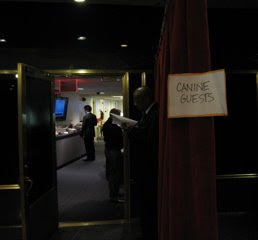 Our dressing area was next to the dogs. First rehearsal at around 6.15am. Rehearsals have to be over before the broadcast begins. 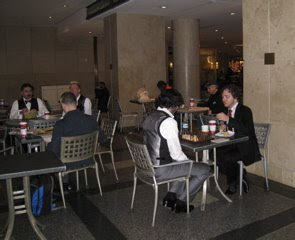 After rehearsal, coffee for some and a chess game for others in the lobby at 30 Rock. 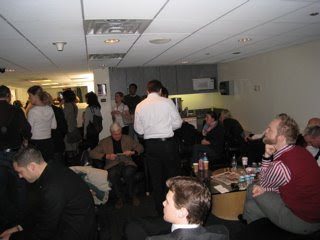 For some reason there were tons of people in the Green Room and we had no idea who they were. And vice versa probably. Some people we do recognize, however. No passing celebrity gets away without a copy of our Christmas CD 'Let it Snow.' Matt presents one to Stacy London ( of TV's 'What Not to Wear'). 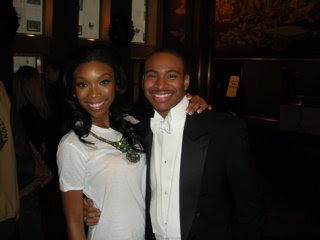 Cortez bonds with Brandi who rehearsed and appeared just ahead of us. 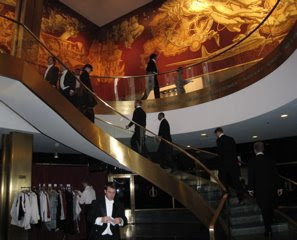 Up the stairs for our first appearance at 9.49am. that Vince Guaraldi's song is on "Mission Road." Kathy Lee and Hoda introduced our second set. Hoda told Adam that he was extremely cute, according to Adam. 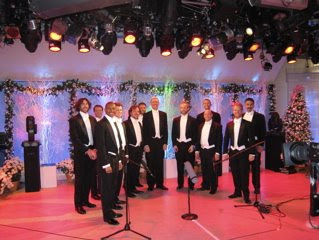 After our last song ( the First Noel ) at l0.57, we send the white tie and tails away for safekeeping before sprinting downtown to WQXR. WQXR has become another regular stop in New York. 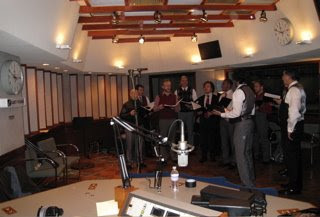 We taped a few Christmas songs and an interview about Mission Road which will be played over the next weeks. 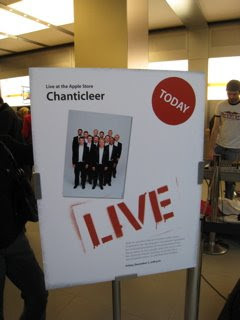 After lunch at WQXR we cabbed back uptown for our 2pm appearance at the Apple Store at 59th and 5th - which has to be seen to be believed. Sort of a Louvre for the I-Pod, absolutely jammed with shoppers. 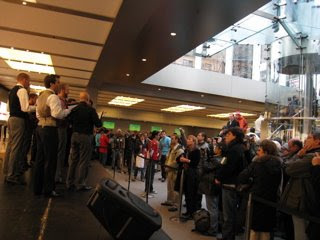 A stage and sound system had been set up, and we got quite a lot of attention!! A 25 minute performance, then back to the hotel for 24 hours off before the next call.